The program was established by the Gender Equity Taskforce (GET) of the NSW Chapter of the Australian Institute of Architects. Chaired by Callantha Brigham, the taskforce is: Tarsha Finney, Maryam Gusheh, Phuong Le, Monica Edwards, Natalie Lane-Rose, Shaun Carter, David Tickle and Agi Sterling. 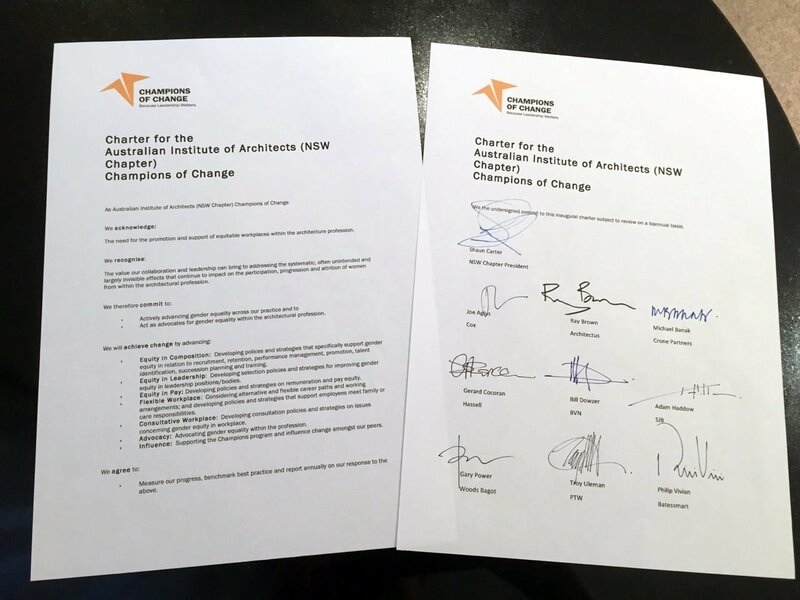 We are pleased to publish the charter in full below. The need for the promotion and support of equitable workplaces within the architecture profession. The value our collaboration and leadership can bring to addressing the systematic, often unintended and largely invisible effects that continue to impact on the participation, progression and attrition of women from within the architectural profession. Act as advocates for gender equality within the architectural profession. Equity in Composition: Developing polices and strategies that specifically support gender equity in relation to recruitment, retention, performance management, promotion, talent identification, succession planning and training. Equity in Leadership: Developing selection policies and strategies for improving gender equity in leadership positions/bodies. Equity in Pay: Developing policies and strategies on remuneration and pay equity. Flexible Workplace: Considering alternative and flexible career paths and working arrangements; and developing policies and strategies that support employees meet family or care responsibilities. Consultative Workplace: Developing consultation policies and strategies on issues concerning gender equity in workplace. Advocacy: Advocating gender equality within the profession. Influence: Supporting the Champions program and influence change amongst our peers. Measure our progress, benchmark best practice and report annually on our response to the above. We the undersigned commit to this inaugural charter subject to review on a biannual basis.